I'M STANDING IN my faux fur, chalet-supplied slippers morning coffee in hand staring out at the shimmering snow. Sun glistens off the slopes and makes the ice on the fir trees look like Christmas baubles. A perfect morning like this is a skier’s dream , yet this is the kind of chalet it is strangely hard to leave. The wide floor to ceiling windows of Chalet Chamois mean that all that beauty outside comes streaming in and with the open fire glowing and the room dappled in light it is almost as tempting to have a leisurely breakfast as it is to get out on the snow. Especially since this ski-in, ski-out chalet means that the slopes of Courchevel l650 are right outside our balcony., so we can be on the piste faster than you can say snowflake. Chalet Chamois is quietly beautiful. The simplicity of its blonde wood and wide windows frames the views beyond. There are seven bedrooms all with ensuite, plus a kids loft with twin beds. The kids’ loft welcomes mini-guests with a life-sized toy reindeer and polar teddy bear the size of a five year old, as well as books, a toy chest and TV. The kitchen is stocked with the very best appliances as well as a coffee machine. The fridge and cupboards are stocked with anything your heart desires from croissants to caviar .All you have to do is ask. The lounge has sink-into-me sofas and a TV and sound system that means there are movies and streaming on demand. 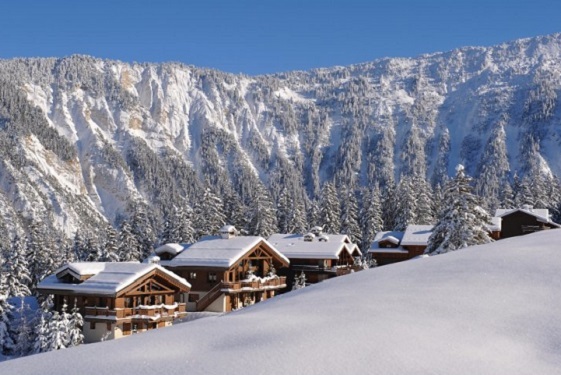 Courchevel offers 8 Michelin-starred restaurants (with 14 stars between them) which means there are more Michelin stars per square metre here than anywhere else in the world. Nevertheless there are many nights when we eat in. This could be because as well as a chauffeur on call and a house keeper Chalet Chamois also supplies a private chef*. At the end of a ski day the outdoor hot tub beckons and sitting there with a glass of champagne, as bubbly as the spa pool just has to be done. Soothing aching muscles and sipping champers is a winning combination. (naturally the chalet is stocked with a selection of wine and champagne*). We also have our own private sauna and steam room, as well as a massage room and a masseuse on call. Despite the level of comfort and the attentive staff this isn’t the most extravagant chalet on the mountain – we don’t have a full sized underground swimming pool, movie theatre or helipad – but it may just be the most chic.